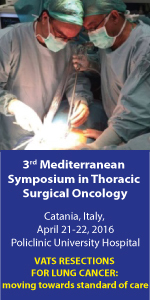 Join Dr. Marcello Migliore (Italy) and Dr. Tom Treasure (UK) this April for the 3rd Mediterranean Symposium in Thoracic Surgical Oncology in Catania, Italy. The 3rd Mediterranean symposium is on VATS resections for lung cancer will be held in Catania 21-22 April 2016. Although more than 20 years have elapsed since the first VATS lobectomy was performed, there are remain open questions that need answers. Moreover, uniportal VATS made possible in 2011 the feasibility of the single incision VATS lobectomy, which has led to in an increase in interest in VATS resections. As a result yet more questions have arisen. Surgeons have to consider the best strategy for lymphadenectomy for example. The recent reports of awake uniportal VATS for lung cancer and the uniportal sleeve resections alert us to expanding indications and the necessity of a targeted surgical training in minimally invasive surgery. Who, and when should uniportal and other minimally invasive techniques be used? But smaller incisions to treat cancer should never put patients at risk. These techniques are not for every surgeon to explore, but if proven to be in patients’ best interests, they should not be avoided but adopted. Another goal of this symposium addresses how the next generation of surgeons should learn these techniques. And then the big question of how to test whether innovations are true improvements in randomized trials.